Reading that, and looking through the musical example on the facing page, any composer can grasp at a glance what Stravinsky’s early compositional modus operandi was. Damn few musicologists can offer compositional insight at that depth. “Higher” institutions for the arts are an altogether different matter from higher institutions in the sciences…. A university imparts nothing but knowledge; a conservatory is not content with that but meddles in the most injurious way in the creative work of an artist trained there, extending its despotic power over the style and form of his work, attempting to force it into a certain academic mold, imparting to it its own customs, and what is worst of all, sinking its claws into the artist’s very mind, imposing on him its own judgment of works of art and their creators, from which it will later on be exceedingly difficult if not impossible for him to extricate himself. …The experience of Europe teaches us that to the same extent that modest schools which limit themselves to the rudiments of music are useful, higher school, academies, and conservatories are harmful. Is this experience going to be lost on us? Are we then required to copy slavishly what exists in other places, so as to have the pleasure of boasting afterward nothing but an enormous quantity of teachers and classrooms, a fruitless distribution of awards and prizes, proliferating volumes of worthless compositions and legions of good-for-nothing musicians? As a music educator by day job, it is uncomfortable for me to admit how much I share Stasov’s reservations: that “modest schools which limit themselves to the rudiments of music are useful,” while “higher academies and conservatories are harmful.” I’ve said here before that I sometimes find myself agreeing with the Harvard faculty who in 1876 tried to prevent John Knowles Paine from becoming America’s first music professor. Certainly students around me are told, in a thousand indirect ways, often so subtly as to ensure the professor’s plausible deniability, that this composer should be admired, and that kind of music should be looked down on. Constraints are almost never explicit, as Cherepnin notes, but are pervasively implied and unconsciously implemented. Young composers are strongly urged to move their music in certain predictable directions, usually toward greater pitch complexity and notational specificity. Even more harmful, they are given historical tools and techniques that most of them, naturally enough, feel obliged to use in their own music – why else would they be paying to learn them? Of course some composers in academia are well aware of these dangers and scrupulously try to avoid sending out such influence vibes, but there’s no penalty for slipping up; I don’t feel entirely innocent myself in this regard. Some composition faculty, and I’ve seen it happen, even show a student how to deliberately write music that will win prizes, even writing the “right” notes into their score. And what’s the result? The more compliant, eager, impressionable students go to the right conservatories and grad schools, get introduced into the system by their teachers, and are chosen for advancement on the basis of their willingness to continue in the style their teachers have marked out as acceptable. On recommendation of their teachers, they get commissions and prizes. So easily do the rewards flow that rebellion becomes impossible. And they are never quite as good as their teachers’ generation. Jacob Druckman was a weaker composer than Roger Sessions, John Harbison is kind of a watered-down Aaron Copland, and their students, their “clones,” are less distinctive still. And the new-music world revolves around a system of “fruitless distribution of awards and prizes,” Guggenheims and Fromm commissions and Prix de Rome, 99 percent of which go to kleinmeisters, people who might have started out with true talent, but who have learned not to jeopardize their status by independent thinking, and content themselves with safe conformism and mediocrity. Of course, for some young composers, a trip through the kleinmeister factory is exactly what they want. For those perceptive enough to be dubious about that route, the potential advantages of higher music education can be difficult to tease out. Given the realities of the world today, I don’t see that there’s much of an alternative for a young creative artist to getting an undergraduate degree, or at least starting one. But grad school is a danger that I urge a student to approach carefully. When a student shows interest, I always ask why he wants to go to grad school. If the naive answer is, “To study and get better as a composer,” I tell him to forget it – that if you improve as an artist during grad school, it will be in the face of the pressures to conform, not because thinking outside the box is encouraged. I emphasize that education, even under the best of circumstances, is something you have to do for yourself, and that great composers (Cage, Feldman) have often had no degrees at all. If the student has the personality to go out and start giving concerts and making partnerships and getting people to collaborate with him, those activities will do more for him than more schooling. 3. to get a doctorate if teaching college is specifically what you want to do with your life. I also recommend as a possibility going to a non-prestigious grad school, which is what I consider the secret of my own success. I had a couple of great teachers at Northwestern – Peter Gena for composition and theory, Gary Kendall for electronics, plus Ted Karp as a musicology mentor – but Peter, who encouraged my most avant-garde enthusiasms, got denied tenure because he was too far out. The rest of the faculty was so many decades behind that they didn’t push 12-tone music because they were still a little dubious about Hindemith. All that “sinking its claws into the artist’s very mind, imposing on him its own judgment of works of art and their creators”: didn’t happen to me, because I was into Brian Eno and Morton Feldman and Harold Budd and other people they’d never heard of, and they didn’t know what to do with me. I was so rebellious and sure of myself that I can’t imagine what would have happened had I gone to some high-powered department where the faculty had stylistic expectations. I probably would have just dropped out. If you have a personality like mine, you can’t pick a grad school for reason #1. I don’t know what kind of educational system, or apprenticeship, might be more helpful than the university and conservatory system we’ve got. One recommendation I’d make is that college departments should try to hire more “outside,” less credentialed, even older and more street-experienced artists, to get some new blood and ideas in and keep everything from getting so inbred – but the prejudice against any such idea, not only within music departments but even more within university administrations, is so ingrained as to ensure that that’s not going to happen within my lifetime. One of my former students studies in Calcutta with a guru now, and thinks it’s wonderful – but he admits he has to hide his electronic music equipment when his teacher comes over, or he’d get bawled out for practicing something besides tabla. So I don’t know what the answer is. But Stasov’s fears about higher music education echo to me 145 years later as very real concerns. The same dangers are present in creative writing graduate schools, I think. Kyle, as you correctly indicate, these attitudes are so ingrained within the academic and musical community as a whole as to make it difficult for much significant change to occur. Want to really get folks riled up: just suggest that one can’t teach composition per se other than the mechanics (counterpoint, notation, orchestration, etc) and see what ensues. The reality is that one either has a vision or one doesn’t, and I’m not sure that vision is really honed by a composition teacher (who, no matter how objective he/she strives to be, is still going to have some influence over a student’s style by dint of his or her authority and power). I think the best “composition teacher” remains the examples around us—I learned everything (and nothing—to paraphrase Feldman) from all the music I listened to and scores I studied on my own. In this way, you learn what works for you, what doesn’t, and eventually push yourself into your own voice. Teachers in many cases undoubtedly want to have their students develop their own voice. But they (the teachers) simply can’t usually make that happen any more than one can make a horse drink water by bringing that horse to water. They just usually can’t. As you mention, there are a few (very few) places that do embrace alternative musics. But these places have been around for a long time, and I’m not sure that there has been much evolution on the part of the other, more traditional, institutions. Juilliard was stuck in the 50’s when I was in their pre-college division in the 70’s, and they’re still stuck. Curtis, Rochester, Chicago, etc. ad nauseum—they’re all stuck. Thank god Reich went to Mills in addition to Juilliard, and good thing you went to NU rather than the U of C. And I’m grateful I never pursued composition studies beyond the high school level. I studied with a nice person, who also didn’t know what to do with me, and after awhile, he stopped showing up to my lessons just as much as I stopped going altogether. I had a great time with my musician friends and learned a lot from them that was invaluable. But no one really “taught” me composition, since no one really teaches composition, just the mechanics. Great—I’ve probably opened up yet another flame war on this topic! I would add one reason to go to grad school–if you get in the right situation, in a school with a really good score library, you might have the time and resources to study and write that you wouldn’t necessarily have otherwise. KG replies: That’strue, and I certainly took advantage of that as well. Another one is, depending on the school, you might have a lot of performance possibilities that would be difficult to arrange outside of school. Seriously, great post (again). If this keeps up, you aren’t going to get much composing done during the sabbatical year! Lawrence, SR is absolutely correct. As in many disciplines, including the sciences, you never know how those basic (and often monotonous) skills will come into play someday. And music schools are great places to learn from scores and records—this was invaluble to me. But interestingly, the U. of Chicago’s Regenstein Library had a much better score collection in terms of new music than Juilliard did in the 80’s, and it was accessible to anyone. So I think one can make out perfectly well with a good liberal arts education while keeping up with scores and recordings. True, the performance opportunities dry up as well, which is a downside of this approach. But the best (and only effective, in my ignorant opinion) composition teacher is one’s own ear. I don’t admire the composers you admire, for I don’t find their music any more satisfying than the ones you don’t like, but you are certainly right about the “kleinmeisters” you named, and the stultifying atmosphere in grad schools. students were clones.I remember hearing only one atonal work by faculty members or students. Maybe it’s a generational thing, but I’ve never had a composition teacher impose any given style on me. To a person, they’ve all been rather “hands off” about my voice, and have focused upon the mechanics of the piece in question. KG replies: That’s sort of exactly the point: neither has anyone else referred to here. The subject of the post is ambitious young composers who choose to compose in the style of their teachers,and who become so rewarded for it that they get addicted to it. As Cherepnin so aptly described, the influences are generally subtle and subconscious and never directly imposed. Kyle, this is a devastatingly accurate analysis of our American musical scene today, and your advice for budding composers is sound. Though I might take issue with this or that particular composer deserving the “kleinmeister” label, your basic premise seems absolutely correct to me. You write about the “professional clothing” for which these composers receive praise; I would amplify that by saying the classical performer establishment is complicit in the dominance of the kleinmeisters. Unfortunately many performers who in theory like the idea of performing new works, limit themselves to supporting those composers who write in styles that allow the performer to draw on physical/gestural/emotional cues that are familiar from older music. In other words, they don’t want to be confronted with a “new perceptual paradigm.” My own impatience with that attitude is expressed elsewhere. I take private lessons from a composer earning a graduate degree — but he may not do it after all! Two turning points occurred. About a year or so into his program he had the immense luck to be invited to write the music for an opera by a well-respected opera house. One of his teachers told him NOT to because he would have to write a type of music the professor was against. He wrote the opera. The second, is that he worked with studio engineers on a recording of one of his pieces and enjoyed their work as much as he enjoys composing. He is presently learning studio production and audio engineering. He happens to be the best composition teacher I’ve ever had! Excellent post. Reminds me of a chapter in Jacques Barzun’s “The Culture We Deserve” that runs in this same vein. Could some room be made though, to account for the quality of supervision/inculcation/inoculation/acculturation given by a certain teacher or educational establishment? Schoenberg had his toadies but he also gave guidance to compelling and original voices (I recall reading a quote from your “Music Downtown” book where Cage said he needed to study with the best, which is why he sought out Schoenberg). Haven’t there been other teachers whose ideas energized, rather than stifle, the next generation? So perhaps it could be useful to put the burden back on the students…whomever decides to be safe and sycophantic is soon forgotten, others take risks and forge ahead. Just my thoughts anyway. I was very interested in this post! KG replies: Thanks, Nathan. Schoenberg wasn’t terribly encouraging to Cage: told him that without an ear for harmony he’d never make it. Perhaps discouragement, for those sufficiently motivated to survive it, does more good than encouragement. My undergrad comp teacher certainly didn’t seem to think I’d make it. It shook me up, but I never considered stopping. I’m sure that a lot of what happens is the result of innocent affinities. I try not to treat one student differently from another, but it’s inevitable that I ultimately become better friends with the students who share my interests. I’m happy for them to write atonal, romantic, or gestural music, whatever they want, but the ones whose influences are minimalist have more in common with me, share more enthusiasms, and we tend to stay in touch more after they graduate. I don’t have prizes and commissions to hand out like some of my colleagues do, but if I did, it’s likely that I’d lean toward the ones whose music is more like mine. It’s hard to see how to keep that from happening. What we need is a music scene in which the “experts,” i.e. the already-famous composers, aren’t the ones who decide what gets played. We certainly need more recognition of the music world’s diversity. And we need to admit that, right now, 98 percent of the new music played by orchestras is absolute crap that merely gives audiences a jaundiced view of new music, and that something ought to be done to spread those resources around. Educating conductors about new music might be a good place to start. Interesting comments from the Taruskin. I wonder though in all this talk about the Belyayev clique, how Scriabin’s individualist music managed to be so succesful with him? I think all of this makes some sense but I would say that unusually acute aural skills must be present before any learning of composition will pay off with a really interesting product. Great music consists of a talented composer playing with the aural implications of sounds, not notes on the page. The cultural stuff is usually irrelevant. The article about the Stravinsky Piano Sonata is really interesting. Obviously Stravinsky had ability and great aural skills but the models he was following in those early works didn’t work well for him. The models Diaghilev gave him worked much better. Having good models appears to be an important factor, as well. Kyle: please excuse me for being about 3 years late on this…but this blog post rings so true and so resonantly with me that I can’t help but to comment quickly. Over the years, I’ve devised a nice (and effective 95% of the time) little test to determine if a composer is a Kleinmeister. Check the composer’s catalogue…chances are, if most of their output consists mostly of pieces for pre-1940 standard ensembles (i.e. string quartets, piano trios, orchestra pieces), they are likely Kleinmeisters. Despite the incredible prominence of the 16-20 piece sinfonietta in the 20th century…they will also have 0-to 1/2 insubstantial pieces written for the particular combination. Finally, a lack of substantial electro-acoustic pieces (or in fact…any engagement with electronics). So under these circumstances…JC Adams would NOT be a Kleinmeister. Interestingly enough…the latter two traits are hallmarks of the continental European Kleinmeister…a genetically completely different animal…but a Kleinmeister nonetheless. The most interesting composers are usually those who come up with strange, unique ensembles…something the stodgy institutions don’t generally care for. In my opinion this book will re-define Stravinsky scholarship. It is by far the best book published on Stravinsky, with perhaps one exception (The Apollonian Clockwork by Andriessen and Schoenberger). 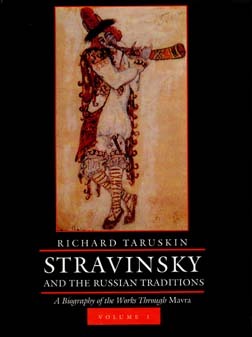 Taruskin’s scholarship is of the highest quality, his knowledge of Russian music,and the revelations he uncovers simply by being a Russian-speaker investigating the sources first-hand make this book a watershed in the way we think about Stravinsky. This book only takes the story to 1923 – I can only hope Mr Taruskin is working on the next volume as I write. KG replies: I dearly love The Apollonian Clockwork too, but am told by the Dutch that it says more about Dutch musical philosophy than about Stravinsky.